Voice Over Artist, Professional Voice Over Artist, Voiceover Artist, Commercial Voice Over Artist, Voice Over Artists. DC is a professional voice over artist for a radio, television, film and all media voice over projects. If you need a dry voice over or fully produced voice overs. Your in the right place! From movie trailer voice overs to small independent films and low budget voiceovers... A voice over artist for large market to small market commercial voice overs . Contact us if you need a Voice Over Artist for your next production. With voice over talent services and satisfied customers around the world. 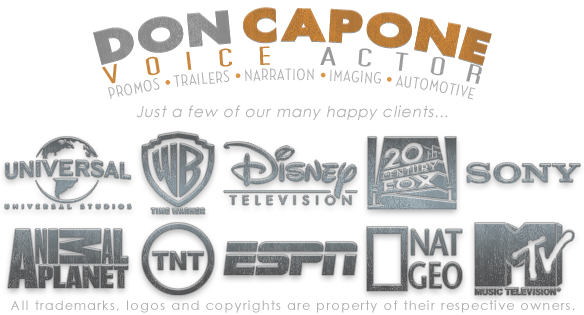 Voice Actor Don Capone offers Commercial Voice Overs for radio commercials, television commercials, films and movie trailer voice overs. Copyright © Nurple.com Voice Talent all rights reserved. Voice Over Actors and Voice Over Production for Voice Overs.